A friend of mine went through infertility hell a few years ago. When we learned of one another’s journeys, we were both glad to have an empathetic shoulder to lean on. Then she became a mother, and developed infertility amnesia. I’m not begrudging her the celebrations, the constant Facebook posts, or the incessant parenting talk. I get it; I’m sure I’d do the same in her situation. But the final straw came last week. A group of us gets together about once a year and we’re starting to plan for this year. We usually go out for dinner, or bowling, or drinks and dancing. Several of us in the group don’t have children and those who do are always glad for a childfree night of adult fun. This year, the new mom suggested we change things up and do something family-oriented and include the kids. “Maybe a beach picnic or Disneyland.” I kid you not. Thankfully one of the other parents shot the idea down, but I had to wonder how she would have felt five years ago, in the thick of her infertility hell, if someone had made this same suggestion. She would have felt excluded and she would have been upset. Which is just how I felt when I got her email. 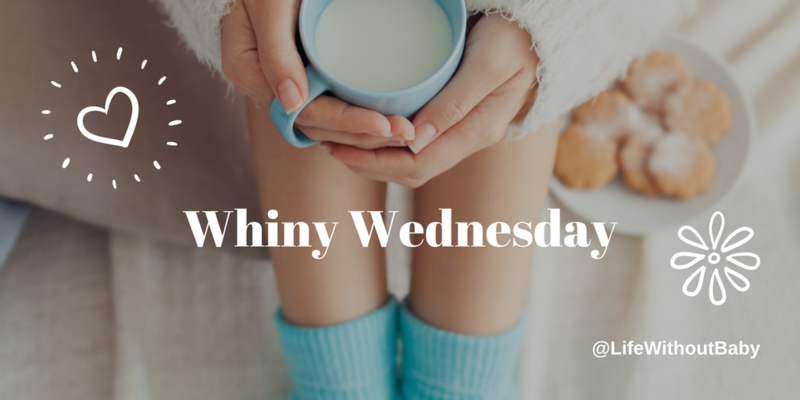 Today is Whiny Wednesday. Who or what has done you wrong this week? I had a conversation with several women last week sitting around a lunch table at work. As sometimes happens the conversation turned to women’s health and everyone’s experiences with conception. I was thrilled to learn that several women had experienced having to use fertility medications to conceive. While it is a terrible experience it was nice to feel less alone. Then one woman talked about the special diet she went on and how her medication helped her ovulate all three cycles she took it and it was finally a miracle that she was able to conceive after two years. I spoke up discussing how sometimes medications and diets don’t make your body work (as this is the case for me and was quite frustrating). This woman sweetly shared that she had done this over a period of several years and it sometimes just takes time. While this is true for some women I don’t think it is gospel for all women. I found it tone deaf and hurtful as I had just shared that we had been trying for three years and had yet to have a successful ovulation from medication or weight loss. I really believe that she meant no harm or hurt towards me or anyone else at the table, but it hurt my feelings deeply as it reinforces the idea that it is somehow my fault that I cannot make my body cooperate. I’m sorry that happened to you. It’s so frustrating when a woman who was able to beat infertility thinks that her solution will work for everyone given enough time! Some of us were brought to the breaking point sooner rather than later, and ran out of financial resources, emotional stability and sanity before we gave it “enough” time. How I wish more would understand that each person has there own version of ENOUGH and the infertility industry does little to support you through it. Again, I am sorry this happened to you. You’ve come to the right place for support. I’m so sorry that happened E.L. I know you are putting your friend in the best possible light, but her response comes across as short-sighted and narrow. I wish your friend had just stopped talking or at least stopped talking about infertility period. I’ve had it where I’m told I’m just being negative when I say it just doesn’t work for everyone, not everyone will get a baby. I find it really frustrating that they won’t accept that and it’s like they are saying my negative attitude is causing the infertility. People are stupid ignorant and just don’t listen. What a rotten experience. I find some friends so set on “winning” a discussion that they just carry on with their view point without stopping to think about what they are actually saying and who to. I had a friend do this to me with a story about a relative who had a miracle baby after infertility when I was trying to explain it doesn’t happen for everyone. I know she didn’t mean to upset me but it left me in a big heap of tears. So I’ve noticed that moms who had trouble conceiving are frequently the worst at being insensitive in the infertility department. Seems odd, right? But it’s something that has proven out to be true for me. Lisa, I know that had I carried full term and delivered a baby, I would not flood the world with pictures and videos. Not because I’m not ecstatic and proud but rather because I am protective and realistic. Then again, I work in software and it’s in my face every day how easy it is to misuse the internet and reveal too much of yourself to the wrong people. So, I’m sure I’m biased to protect. I had a friend who had infertility problems, but got pregnant after eating well so she assumed that must be the reason she got pregnant. So then she started a business that effectively makes women trying to conceive feel negatively about themselves because apparently the only reason they aren’t getting pregnant too is because they aren’t eating well enough. She uses that tactic in her advertising. So anyone with a bit of a weight problem is going to feel shame when they see her ads. Like we don’t have enough to feel crappy about. I absolutely hate her. Infertility amnesia is an amazing thing. A coworker and I were both dealing with infertility and undergoing IVF. When she got preggers she informed me that she finally “felt like a woman.” I believe that is how she felt, but, that was not the experience to share with me. Needless to say, that relationship got relegated to the trash pile. In some ways, infertility amnesia feels like the biggest betrayal.